It's March already! Not quite spring, but here in south central Pennsylvania, we can almost see it coming. The forsythia bush outside my office window has already burst out in yellow blossoms, and both dogs and horses are shedding winter hair like mad. In March, Allison Turner and Jay Kirkpatrick will be PZP-darting mares again on Assateague Island. These can be some of the loveliest days on Assateague, as new life appears in many forms, and before the biting insects arrive to make things a bit more uncomfortable for both humans and wild horses. I'm looking forward to hearing if there are any new foals this spring, too, and will update you here! 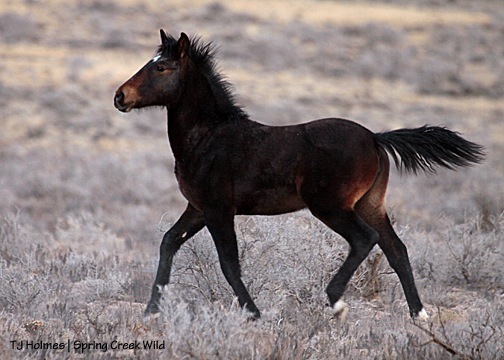 Last month my guest columnist, T.J. Holmes, described how PZP and activists have begun changing how wild horse population numbers are kept in check in one BLM-managed herd in Colorado. Today I was reading about how the BLM is using science to inform management decisions for the Pryor Mountain wild horse herd. You can check this out at the BLM site here. I think it's really interesting that the agency has commissioned a study by the National Academy of Sciences to evaluate their past management strategies and policies, and make recommendations based on scientific evidence. And one more note: I was honored to learn recently that Wild Horse Scientists has been named one of five books to win this year's John Burroughs Riverby award, which recognizes outstanding natural history books for young readers! Very, very cool. You can read all about it, and about the fascinating John Burroughs, himself, here. Click on the link for "full press release."